Imagine traveling to a place that is rich in history and natural beauty. Now imagine being in that place and being a part of something that is changing lives on a daily basis – something that is fighting injustice and exploitation at the grassroots. That is what our Thailand Live Different Build is all about! Live Different works in northern Thailand, in a small community in Chiang Rai province. In this place we have discovered some real life heroes, and it is an honour to be able to work alongside of them and be a part of what they are doing to fight slavery and exploitation. Thailand is a beautiful country and the Thai culture is full of laughter, friendship, and deep respect for one other. However, Thailand also has been a country that has had many dark secrets and many women and children have been victimized by exploitation and slavery within its borders. During our time in Thailand, we will become a voice for abolition and freedom, as we help Buddies Along the Roadside, a grassroots foundation that reaches out to children and families that are caught in the destructive web of sexual slavery and exploitation. Our help comes in the form of building projects and time invested in the children that are now safe and being rehabilitated in the home in the Chiang Saen province, which is always deeply appreciated and welcomed. When in Thailand, you’ll volunteer with children who have been rescued from exploitation and work on a project that will enhance the home that they live in. While in Thailand you’ll stay in a quaint, small hotel in the town of Chiang Saen located in the Chian Rai Province, approximately a 10-minute drive from our project site. Our rooms in Thailand are double occupancy and are clean, air-conditioned, and have hot water. We also have consistent access to internet and bank machines. While staying, you will taste some of the best food ever! Our meals are a combination of eating with the kids at the children’s home, local restaurants and meals prepared by friends of Live Different. There are always vegetarian options available, and you will always be well taken care of. 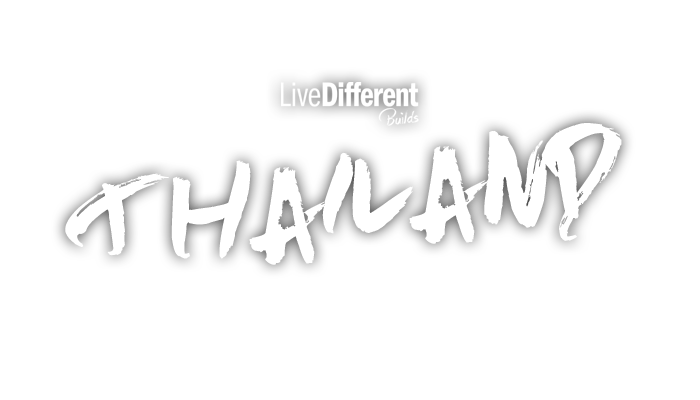 Live Different has been traveling with our groups to Thailand since March 2007. While working alongside our Thai friends we have developed friendships and relationships with organizations that are on the ground making a dramatic difference in the lives of children at risk. Whether arranging transportation, building projects, meals, best locations markets and excursions, our Thai staff are exceptionally experienced. Before a Live Different Build begins, all parents are given emergency contact numbers for Live Different ground staff and contact numbers/emails for the Live Different office. We are available at any time for parental concerns or emergencies. Questions about our work in Thailand?